Confidex announced that its ultra-high frequency Gen2 RFID tags are being used in Container Centralen’s full scale RFID rollout called “Operation Chip It!”. Container Centralen will use the tag as an electronic seal on its fleet of 3.5 million containers to enable transparency in the supply chain as well as improve overall quality of container pool by reducing risk of counterfeit containers to be included into the pool. 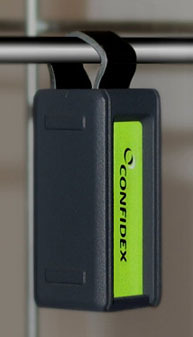 Utilizing a patent pending tag design, Confidex developed an electronic RFID “e-seal” to verify the origin of the container without compromising the tag size and read performance requirements of the logistics operations. The tags are identified and verified with RFID handheld devices, supplied by NordicID and others. Installation of the “e-seal” tag is pretty straightforward with no additional tools required and the robust tag is also able withstand extremely harsh use in outdoor environments.